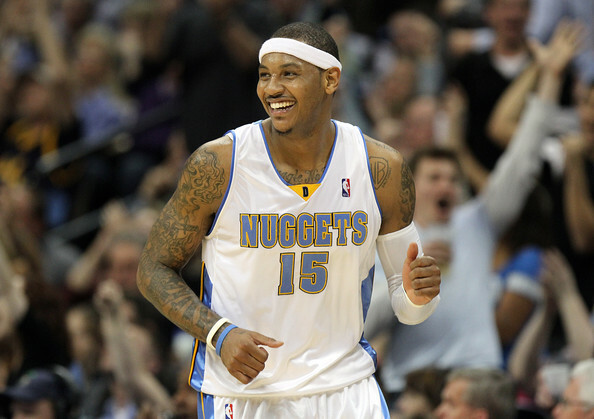 The NBA is overflowing with rumors about a 17 player trade that would send Carmelo Anthony to the New Jersey Nets. Carmelo Anthony could wind up wearing a NJ Nets' uniform. The Nets’ pursuit of Denver superstar Carmelo Anthony with Detroit entering the mix could result in the largest trade in NBA history under an incredibly complex proposal which is one of about 20 scenarios being considered. As many as 17 players, plus multiple draft picks, could be involved in the deal, several sources confirmed. One league executive said “15 to 17 players could ultimately be involved.” And there are all the draft picks to consider, too. The Nets, who have sought to do a team-to-team trade with the Nuggets, have induced Detroit into the talks with the Pistons eager to shave salary. The Nets, under the whopper trade which is nowhere near close to be completed, would essentially gut their current roster. At 10-26, that might not be a bad thing.